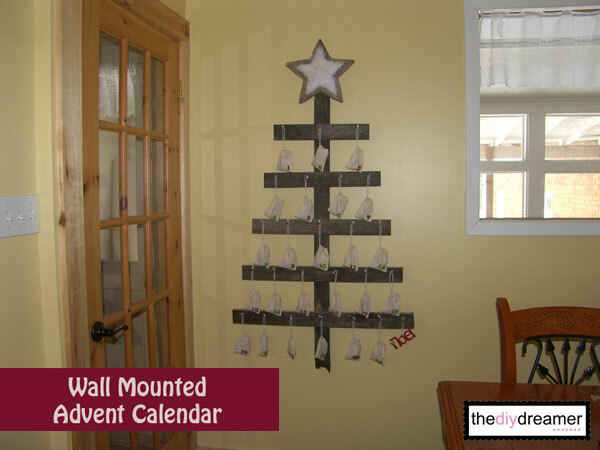 Wall Mounted Advent Calendar! A Keepsake Christmas Decoration! I’ve been buying chocolate advent calendars for years, however I never display them because they are tacky. We usually hide them on top of the fridge and take them down each morning for the girls to open their special doors and then we place the calendars back in their hiding spot. However, this year we decided to put and end to the chocolate advent calendars, instead… we created our very own Advent Calendar. Oh and not just an advent calendar but a huge 4 feet wall mounted advent calendar. 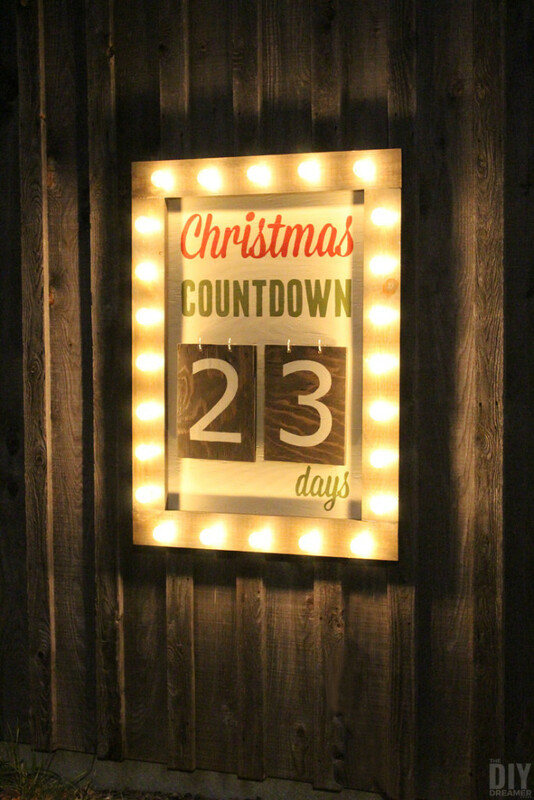 UPDATE – We painted our kitchen and our Rustic Wall Mounted Advent Calendar looks so good! It’s really GORGEOUS!! I wish I would have been able to take jaw dropping pictures, but there’s absolutely no sun today… just a grey snowy day. Trust me, it’s a lot nicer than it seems in the pictures. I’m in AWWW every time I go in the kitchen and I see it mounted on the wall. This post contains some affiliate links for your convenience. Click here to read my full disclosure policy. First Step: Gabrielle, Emanuelle and I started off by stenciling numbers onto 24 muslin bags. 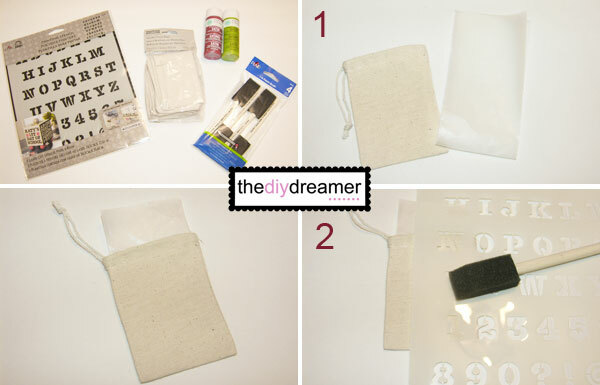 24 Muslin Treat Bags – The bags we bought were 3″x4″. Step 1: Cut little pieces of wax paper to insert in each of the muslin bags (this is to prevent paint soaking through to the other side of the bag). 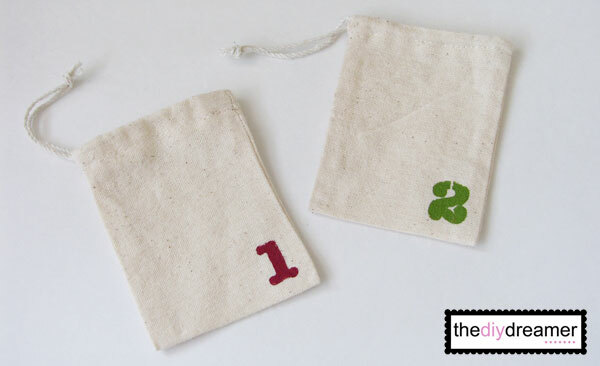 Step 2: Place your stencil on your bags and use a foam brush to paint on the appropriate numbers. And voilà, you have yourself some advent bags to put in little treats. Step 1: Cut all your pieces of wood. Step 2: Hammer in your antique nails onto the 5 shortest pieces of wood. Make sure you leave them sticking out so you can hang your bags. Step 3: Glue and nail each piece onto the 48” long piece of wood. Make sure you place them all centered and 5.5” apart and that you go from shortest to longest. Step 4: Read the instructions of your hanging kit and place the appropriate piece onto your advent calendar and the other piece onto the wall. 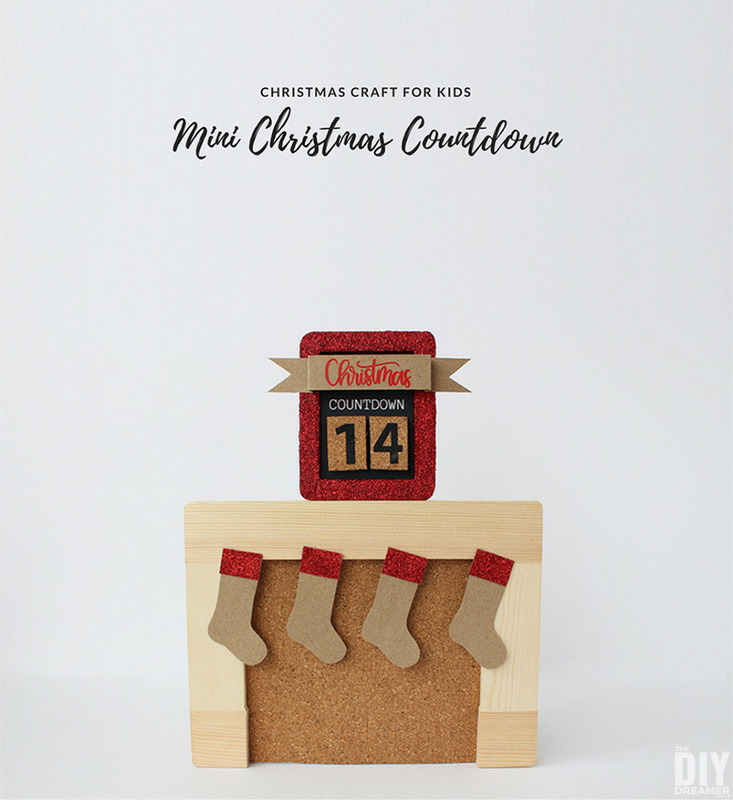 Step 5: Turn over your advent calendar and place felt pads onto the back (to protect your wall from scratches). Step 6: Glue two wine corks onto the back of the 32” piece of wood (this is to prevent the advent calendar from swaying side to side). Step 7: Attach your star onto your advent calendar. Step 8: Hang it up onto the wall. 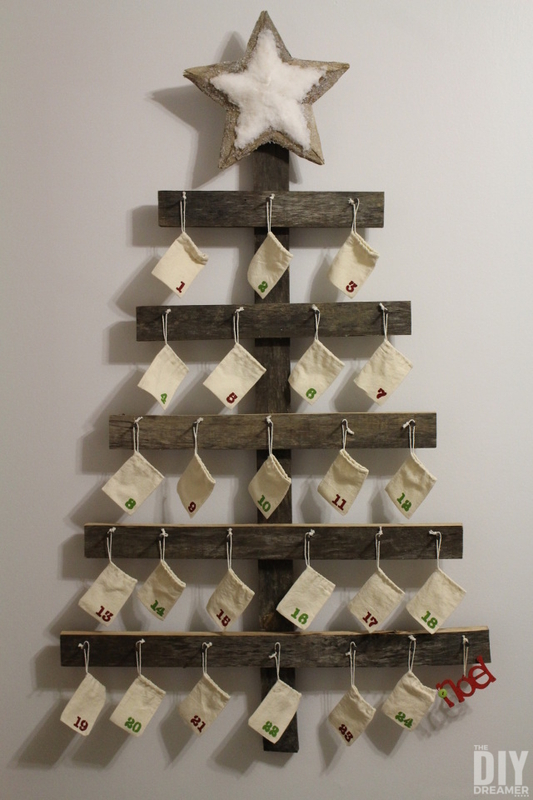 Step 9: Hang your advent treat bags and place your Christmas ornament onto the last nail. And, what do you think of it?? The girls are IN LOVE and they can’t wait to see what is in each bag!! And I’m soooo PROUD OF IT!!! It’s going to be something we’ll get to keep forever!! 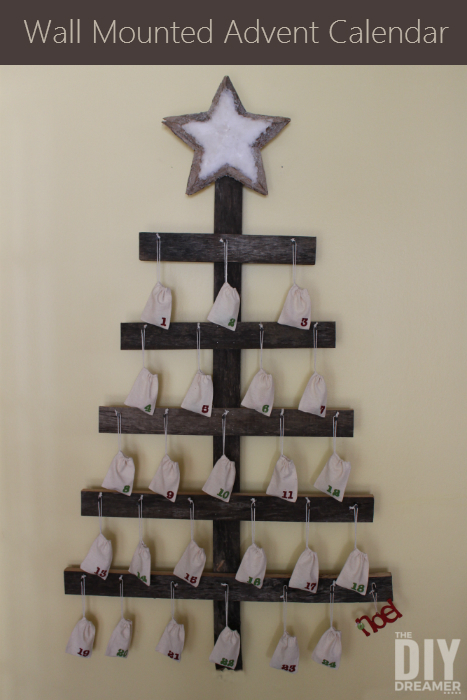 What a fun Christmas tree that doubles as an advent calendar! You are so ingenious! And it’s adorable too as a bonus. way to go Christine! way to go! it’s so awesome :) clap clap clap clap clap!!!! Love this idea.. Such a great advent calendar. Christine, I love this project. I love the rustic and simpleness of it! Very well done! I’m hosting a homemade holiday party with prizes and I think this project would be a great one to share. I’d love if you’d stop by. This is a really cute idea. I’m pinning so I can remember it for next year! Thanks. I love this idea. It is completely adorable. WOW Christine, no matter what you say about the pics that is amazing. Awesome advent! LOVE IT! I have always wanted to make my own. My kids are allergic to nuts and you can never find one of those chocolate ones in the store that doesn’t contain them or isn’t made on the same equipment :(. Yours is so cute!! I can’t wait to do my own version! This is…without a doubt….my favorite Advent Calendar I’ve come across. Been looking for ideas for a long time…and this is the one I will make. Thanks for sharing! 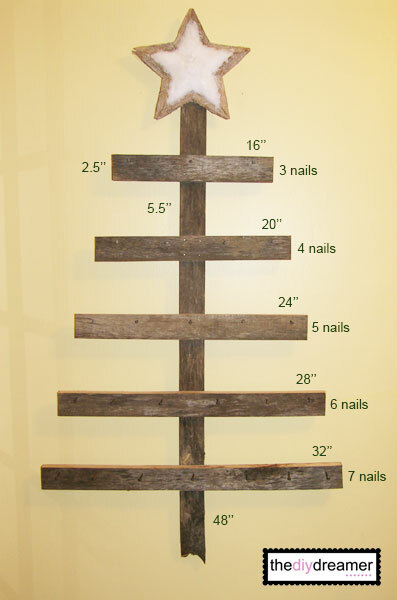 I would love it if you linked up your advent tree. great idea!! this would be a cool memory- and take a pic of the kids with it each year as they grow! This is so pretty! Looks like it’s out of a catalog :o) I just featured you this morning on my Facebook page, so make sure to grab a featured button! Beautiful!! Great job, Christine! What a wonderful tradition to enjoy and look forward to for years to come! YEA Christine! I’m so glad you linked this project up! It always makes me smile when I see it! Thanks for sharing at the homemade holiday party. It really is so cute! I love how it turned out. Great work. I feel like you can never have too many advents! That is adorable. Thanks for sharing. Linked up with you from A Glimpse Inside! Christine, I really love this idea! Looks great. This is awesome!! I always love a good advent calendar! Thanks so much for coming out to the party at Clean and Scentsible. I will be featuring this on my Facebook page and pinning. Happy Holidays!! I really love this! I had to do away with my Advent Calendar plans for this year because I was just too frazzled by November 29th trying to put it all together. I’m going to have to pin this so I can make one in like July when I’m trying to find something to do. Great job! Great idea and nice tutorial. Thanks for linking up at the Adorned From Above Blog Hop. This is amazing! 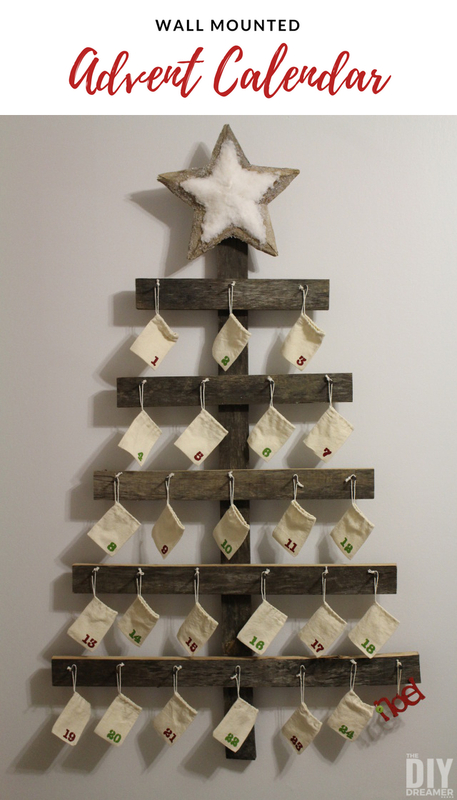 I love how it seems simple to make, but is so eye catching and looks store bought! I love this advent calender. It is so cute. Thanks so much for sharing at Wednesday’s Adorned From Above Blog Hop. Hey Christine! What a great idea!!! I love it. Thanks for linking up last week at the Humble Brag. You were featured, so be sure to stop by and grab a button! Hope you’ll come back tomorrow to link up. Also the Silhouette Cameo giveaway ends this weekend! LOVE THIS!!! The wood that you used was it something you had on hand, or did you purchase it? Thanks so much! !